Counting carbs is easy to do. All you need is a source of information that gives the carbohydrate and fiber counts in grams of specific portions of foods. It can be a book, or a database or website on the internet..
by Gary Scheiner, MS CDE. USDA Nutrient database: This resource is free on the web. Food labels; but be aware food manufacturers have a bad habit of not being truthful about how many carbs are in their products. And you have to remember to check serving sizes as well. If you are looking at a large container of yogurt, and it says 16 carbs per serving, make sure you check to see if there is more than on serving in the container. If there are two servings, than the total carb count for that container is 32, not 16. The most important part of counting carbs is to understand the difference between total carbohydrate measures, and the measure of usable, impact, effective or "net" carb carbs. Total carb is the count of all of the carbohydrate grams available in the food, including fiber, sugar alcohols, and other indigestible carbohydrate. Usable, impact, effective or "net" carbs are a measure of the total carb grams MINUS the indigestible carb grams. 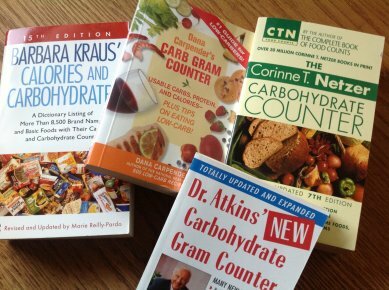 So in most carb counting books, you'll see a measurement of total carb grams, fiber grams and then the net or usable carb grams. To count carbs accurately, use the net or usable carb number when adding up your carb intake. If you are eating a ketogenic diet for weight loss, and you are new to counting carbs, I recommend that you keep track of what you are eating in order to be to count carbs accurately. This means keeping a food journal or buying software to track your food intake. After you've been on the diet for a while, you'll get a pretty good idea of how much carb is in different foods, and then you should be able to track it accurately without writing everything down. Of course, if you are just eating a ketogenic diet for health reasons, you don't need to know how much carb is in your food. Just the act of cutting out the obvious carbohydrates (breads, crackers, pasta and sugar) from your diet will help you feel 100% better. Note on sweeteners: Some people on ketogenic diets use sugar alcohols to sweeten yogurt or low-carb cheesecakes. Sugar alcohols are are sugar molecules which are undigestible. (Examples include erythritol, mannitol, sorbitol and the like.) Many people in the low-carb world feel that sugar alcohol carbs do have an impact on ketosis and blood sugar, and so they count them in when totaling up usable carbs. Other people are able to eat them without any effect on weight loss or ketosis. You'll have to learn what works for you by trial and error.